Sadly, the ascension is regularly neglected or forgotten. The ascension is surely essential to NT theology, but what did it mean in the first century? And what role did it play in Luke’s writings, in which it is found? 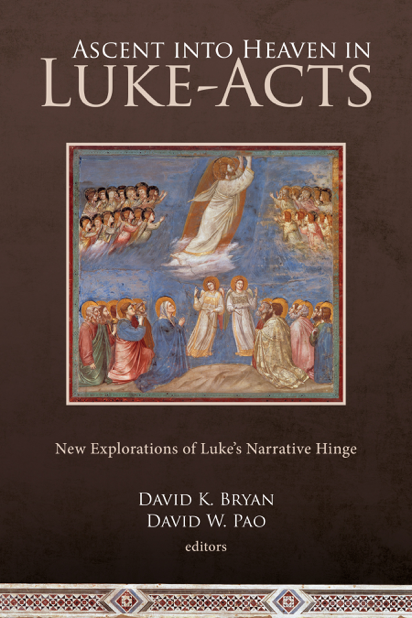 This is where Ascent into Heaven in Luke-Acts: New Explorations of Luke’s Narrative Hinge comes into play. The book has two goals. First, to consider ancient contexts that may have influenced Luke’s presentation of Jesus’ ascent. Second, to consider the importance of the ascension narratives within the larger work of Luke-Acts. Arie Zwiep surveys the past twenty years of scholarship on the ascension, noting the most important and controversial issues. Steve Walton compares the ascension of Jesus with those of Enoch and Elijah’s own ascensions, arguing that there are striking similarities between Elijah’s and Jesus’. Joshua Jipp considers Luke’s use of the Psalms to portray Jesus as enthroned messianic king. David Bryan first notes that the cosmological and hierarchical conceptions found in Second Temple Jewish literature are also seen in Luke’s ascension narratives, and then considers the implications. James Buchanan Wallace compares Jesus’ ascension with Greco-Roman ascension stories, noting that these ascent stories emphasize the benefits given to one’s followers, rather than the status of the ascended individual. Moving to consider the ascension within Luke-Acts, Stanley Porter argues that the two accounts of Jesus’ ascent in Luke-Acts are not at odds, and thus are not evidence of multiple authors or a lack of unity in Luke-Acts. Jesus considered His ministry as bringing the restoration of Israel. But what role did the ascension play in this mission? David Pao considers this very question. Matthew Sleeman examines the implications of spatial theory for our understanding of the ascension. Charles Anderson presents Jesus’ ascension as a right-ordering of fallen creation. Rick Strelan argues that cultic practices of the first century determined Luke’s presentation of Jesus’ ascension. In other words, the account is driven not by historical recollection but to harmonize with the established liturgy of the ancient church. Finally, Douglas Fallow responds to the essays from the perspective of a theologian rather than biblical scholar. His critique will be noted below. I must admit that, brandishing my evangelical presuppositions, I was disappointed a number of the essays appeared to ignore the scriptural context at the sake of an external one. Particularly, the arguments of chapters four and nine were unnatural to the text and added little to my understanding of Luke-Acts itself. Chapter ten was uninteresting and unconvincing. More interesting were chapters that took scripture seriously; such as chapters two, three and eight. My criticisms are supported by those of Douglas Farrow. As is to be expected from a British introvert, I am one that holds my punches. However, I had to fist-pump a few times at Farrow’s much more unflinching pummeling of most of the authors. His final chapter was reminiscent of a bull in a china shop. According to Farrow, Wallace “bring[s his] own presuppositions” into his scholarship by having “difficulty allowing that the story might be true.” Strelan’s presentation is essentially gnosticism. Sleeman’s thirdspace is a “distorting lens” for the text. Walton forgets the incarnation. Bryan “refuse[s] to allow Luke to tell us that the ascension…fully effects his exaltation”. Being a theologian, he accuses biblical scholarship of wandering “a very long way from its starting point, or rather from Luke’s pointing point”. His fundamental critique is that most authors affect a non-theological stance, yet their individual controlling presuppositions are made evident. I must admit to being disappointed overall in Ascent into Heaven in Luke-Acts. It was not what I expected it to be. While it’s usually bad form to critique a book for what it isn’t, in this case I expected to better understand the Biblical and theological implications of the ascension. Aside from some very helpful chapters (2, 3, 6, 7), the book did not achieve that goal for me. For other readers, this book will fulfill what they ask of it. For those who wish to encounter a range of contemporary scholarship perspectives on the issue, Ascent into Heaven in Luke-Acts would be a useful book.